Researchers have spent over 50 years improving the performance of HgCdTe infrared (IR) detectors and it is currently the dominant technology in the field; however, further improvement may be limited due to devices reaching the intrinsic limits of their constituent materials. To further improve the state-of-the-art in space-based IR detection, alternative material systems are being considered. The focus of this work is testing the space-environment viability of innovative device structures, namely unipolar barriers with Type-II superlattice (T2SL) absorbers, made from the 6.1 Å family of III-V elements which are theoretically superior performers while being less costly. Sensitive IR photo-detection using III-V material systems has been demonstrated; however, overall performance to-date has been hindered by short minority carrier lifetimes attributed to high concentrations of Shockley-Read-Hall (SRH) recombination centers. This problem is exacerbated when these materials are exposed to charged particle vi irradiation, as is unavoidable for spacecraft electronics, due to displacement damage increasing the concentration of SRH defects. In this work, a measurement system was designed and constructed to directly measure the minority carrier recombination lifetimes of prototype IR detector structures at the wafer die level as functions of proton fluence and temperature, to include both HgCdTe and the new 6.1 Å T2SL nBn technology being considered. 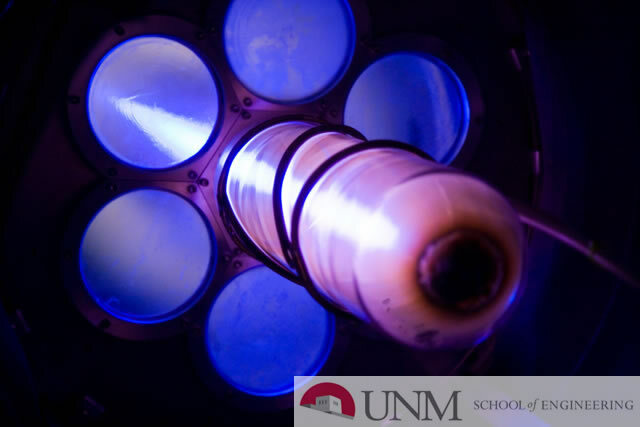 It is unique for two reasons: 1) it was designed to be portable which allows in-situ lifetime characterization vs. stepwise proton irradiation by deploying it to radiation sources across the country, and 2) through cryogenic cooling, it maintains samples at mission operating temperatures throughout entire irradiation experiments which enables post-radiation annealing studies. The typical radiation test found in literature is a single, large dose performed at room temperature. The conclusions in this dissertation are derived from analyses on data acquired from this measurement system at a monoenergetic proton source. Radiation tolerances of the minority carrier lifetime and post-radiation annealing effects are compared between HgCdTe photodiodes and 6.1 Å T2SL nBn detector structures, the effects of doping and other design parameters on the lifetime damage factors in III-V materials are investigated, and a damage factor vs. proton energy (NIEL) study was performed on III-V structures which allows spacecraft mission planners to extrapolate lifetime damage factors in these materials through any proton differential energy spectra of interest, i.e. satellite orbit.